Wehgo (my modern paint by number kit business) has been keeping me busy! I've still taken on a few crafting, decorating, and party projects - but I haven't had time to post anything. This weekend I spent a lot of time hanging with my kids. While playing board games with together, we came up with a cool idea that I think other parents and kids will love. So my kids have been BEGGING for fidget spinners - you know those little spinning toys that are driving parents and teachers crazy? Well My kids finally got their own and after about an hour of excitement and spinning they were cast aside. My son picked his up casually while we were playing a board game on Saturday. As I watched it spin in his hands, the idea of a game that incorporates the fidget spinner was born. I shared my idea with the kids and we started sketching it out. By the end of the day we had a game board (actually a large game mat, that we made with oil cloth and vinyl stickers cut with my silhouette machine) and basic rules of play. We played the game and made a bunch of tweaks to the rules and how to play. Yesterday I created a smaller (8.5' x 11') PDF Printable version of the game. You can download it here. The game is easy to play. 2-5 players move game pieces across a grid. Players spin their fidget spinner on a color wheel to determine where they can move. Depending on the square they move to, they have to complete a fidget spinner challenge or challenge another player to stay on their square; they have the option to switch with another player on the board or spin to move to a different color; or stay put (blank squares). Players can move forwards, backwards, and diagonally. They can also block other players - the game has a nice amount of strategy which makes it fun for adults to play too. My kids loved using the spinners for game play. They helped come up with the challenges and some are pretty tough. To remedy this, the game includes number cards that you draw every time you do a challenge. The number you draw is the number of chances that you get to complete the challenge. The downloadable version of the game on Etsy also comes with blank cards for players to write their own challenges. - Spin your spinner on one finger while standing on one foot for 20 seconds. - Spin your spinner on one finger and pass it to one finger on your other hand without losing spin. 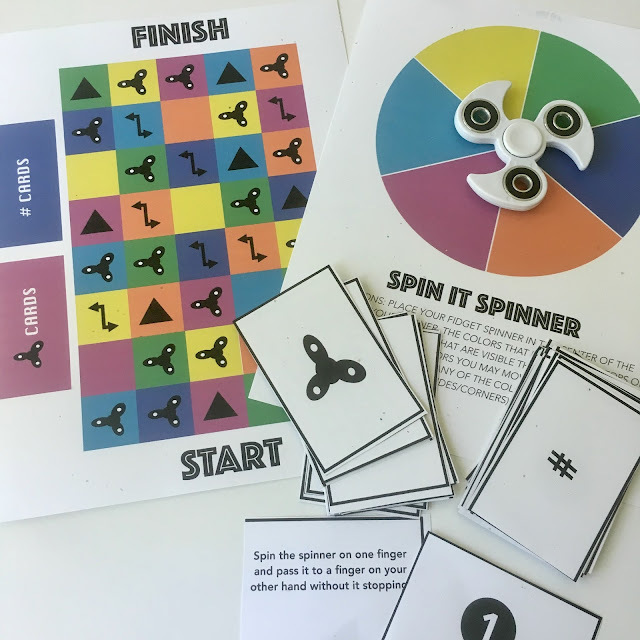 If you'd like to try our little game, Spin It!, you can download it on Etsy for $5. If you do give it a try, we'd love to hear feedback on how we can make it better.